Retro watch styling and nothing to hold you back, not even a headphone cable. The vívoactive 3 Music stores up to 500 of your favourite songs and plays them over Bluetooth so there are no cords to get in your way. The latest-generation Elevate optical heart-rate monitor reads your pulse information straight off your wrist. GPS and an internal accelerometer track training metrics like speed and distance information, turning your movement into data and making sure you get credit for your work in the gym and on the trails. 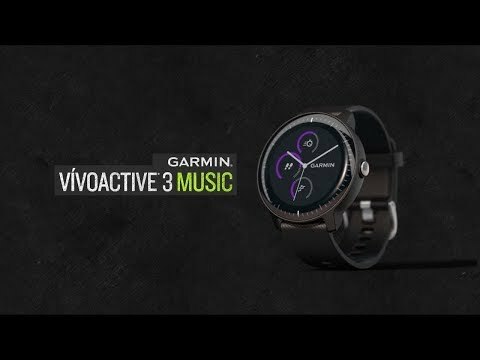 Pairing it with the free Garmin Connect app on your smartphone opens up a whole new set of features: review activities, receive notifications, control phone apps like music players or VIRB cameras. Follow daily highs and lows by tracking stressors (monitoring your heart-rate variability). When stress levels are high, a relaxation timer walks you through steps to reduce them. Monitoring your activity and heart rate 24/7, Garmin’s tech learns your activity level and guides you towards a healthier lifestyle. Move IQ intelligently detects your activity and tracks the activity; these activities appear in your Connect timeline and ensure you get credit for all of your daily exercise. Download playlists via iHeartRadio or Deezer (coming soon) streaming services, or drag and drop MP3s from your computer through Garmin Express. File types supported: MP3, M4A, AAC, ADTS, WAV, M3U, M3U8, WLP, ZPL, PLS. Playlists synced from streaming services are automatically updated when in range of configured Wi-Fi networks. Holds up to 500 songs (depending on music quality). Garmin Pay™ contact-less payment system lets you pay for purchases through NFC. By linking credit cards to your Garmin account though Garmin Connect, you can make payments with your watch (if supported by your bank). Internet Live Tracking during activities (through a connected smartphone) allows you to share your location and heartrate with friends, family or coaches. Broadcast of your HR over ANT+ (so other devices can pick it up). Stress level score monitors heart-rate variability while inactive to produce a stress score from 0-100, the lower the score, the lower your stress. When stress levels are high, the vívoactive’s relaxation timer will take you through steps to lower your stress levels. 24/7 activity tracking: vívoactive learns your activity level and helps guide you towards a more active lifestyle. Onboard sleep tracking mode monitors your rest, letting you see your total sleep hours as well as periods of movement and restful sleep in your Connect profile. Counts flights of stairs with internal barometric altimeter data that’s combined with your step data. Counts reps during your workout. Download or create custom workouts through Connect. Automatically sync your data to a paired smartphone running the free Connect app. Basic waypoint navigation care of the internal GPS and compass. Back to start feature directs you (as the crow flies) to where you started your activity. Intuitive touchscreen interface make navigation easy. Rechargeable lithium-ion battery lasts up to 13 hours in GPS mode or 7 days as an activity tracking smartwatch. In the box: vívoactive 3 Music, charging/data clip, documentation.